Shelter for anybody sleeping rough across Chichester and Arun is available now so no one has to be out in the cold, homeless charity Stonepillow is advising. 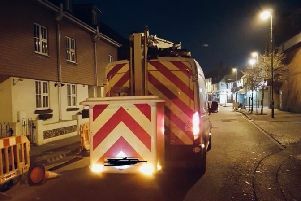 With temperatures below freezing and snow falling, both Chichester and Arun district councils has implements its Severe Weather Emergency Provision (SWEP), meaning there is a warm bed and food available for anyone on the streets. Fiona Macleod, joint interim CEO of Stonepillow, said: “Our advice for Chichester and Arun rough sleepers is that no one needs to be on the streets right now. “Our hub services are open as usual offering warm clothes, warm food and support, and if you’re not already in one of our hostels, we are able to undertake a referral for you to either the Bognor Regis or Chichester SWEP where not only will we offer you shelter, warmth and support but also start looking at ongoing housing solutions past the end of this severe weather. “Homelessness doesn’t just happen in cold weather, but is an issue all year round. Anyone who is homeless who is in need of a bed, or if you know someone on the streets, should call Stonepillow on 01243 537934. Fiona added: “If you wish to support the work we are delivering to homeless people in your area at this freezing time of year, then please Text the number 70070 with the word HSTL24 £10. “Alternatively please visit our website www.stonepillow.org.uk and make a donation through our donation page.